Alec McKenna grapples with an opponent. The sophomore will likely be up against some tough competition at 141 pounds this weekend. Following a disappointing weekend with losses against No. 7 Iowa and No. 18 Rutgers, Northwestern will look to turn the tide at No. 22 Purdue on Friday before travelling to Bloomington to take on Indiana on Sunday. With last week’s loss, the Wildcats (8-4, 3-4 Big Ten) sit at No. 19 in the rankings, a two-spot decline from last week’s No.17 spot. Coach Matt Storniolo said NU is focused on what it needs to do to win both bouts this weekend. 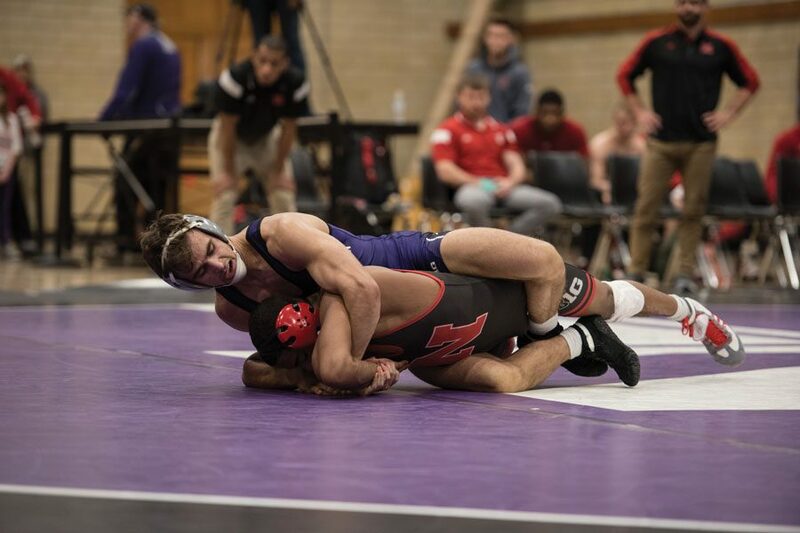 The Cats are led by redshirt freshman Ryan Deakin, NU’s highest-ranked wrestler who sits at No. 5 in the 149-pound weight class. Deakin suffered his sole loss in Big Ten dual competition against the Hawkeyes and will try to end the Big Ten season with a 12-1 record. Deakin said he is looking forward to having another chance to get out on the mat, and identified areas where growth is essential. Also ranked is junior Johnny Sebastian in the No. 19 slot at 174 pounds. Sebastian is undefeated in conference competition, the only NU wrestler who can claim that. He will face tough competition on Friday against the Boilermakers, facing Dylan Lydy, who holds the No. 12 spot in the 174-pound rankings. Sebastian defeated Lydy in the Michigan State Open with a pin in the last period. On Sunday against the Hoosiers (6-9, 0-8), Sebastian will face Devin Skatzka in the No. 20 slot for their weight division. Sebastian said he is looking forward to the challenges. Sophomore Alec McKenna will also be wrestling in highly-contested matches at 141 pounds against No. 16 Nate Limmex of Purdue and No. 17 Cole Weaver of Indiana. Redshirt freshman Sebastian Rivera, ranked No. 10 at 125 pounds, will wrestle Luke Welch in West Lafayette. Welch is ranked No. 17 for the 125-pound weight class. Storniolo said the Cats will have to “go out and showcase their talents” to get two key wins this weekend, and referenced the Boilermakers’ win against Indiana last week.